The Indonesian archipelago has a rich history of taking outside influences (especially religious ones) and adapting them to complement existing social structures, traditions, and belief systems. The first major encounters with Islam date from the thirteenth and fourteenth centuries when the religion arrived peacefully via trading merchants from Persia and India. Spreading gradually to Sumatra, Java, and beyond over the centuries, Islamic practice including Sufi traditions amalgamated with indigenous custom and became part and parcel of many of the archipelago's different cultural identities. The largely secular-nationalist minded President Sukarno succeeded in marginalizing political Islam. His successor, Suharto (in fatigues), led an anticommunist purge, which had the unin-tended consequence of prompting the vast majority of Indonesians to identify as Muslims to escape the communist dragnet. This gradual syncretic adoption is reflected in predominantly tolerant and diverse forms of religious expression across Indonesia. For instance, on Java there is a distinct difference, in terms of religiosity, between two major Islamic strands: Many nominal Javanese Muslims (abangan) identify with an indigenized syncretic form of practice, Agami Jawi, while other Javanese identify as Santri, practicing a stricter but still moderate form of Islam. Outside Java, believers in places like Aceh in northern Sumatra, parts of the Moluccas, and in central Sulawesi (formerly known as Celebes) observe a stricter practice while, on the other hand, some Sasak on the island of Lombok still adhere to an Islamic animist-ancestral amalgam known as Islam Wetu Telu. In fact, one could say that in the majority of cases, a dynamic and tolerant equilibrium exists between the archipelago's overlapping strands of national, religious, and cultural identification. Indonesians share a strong sense of national, political identity forged from a common history of anticolonial struggles, shared national language (bahasa Indonesia), and state-sponsored education. The size of Indonesia's two major socio-religious organizations also gives one an appreciation of the influence of Islam in daily life. Both organizations boast many devout followers. The traditionalist Sunni Nahdlatul Ulama (NU, Awakening of Ulama) has about 30-35 million members and formed in 1926 in reaction to the reformist Muhammadiyah (Followers of Muhammad). Its raison d'être is to spread and retain conservative Islamic teachings and practices through a large network of religious boarding schools. The reformist Muhammadiyah numbers approximately 29 million. Established in 1912, it focuses on social and educational activities through a promotion of ijtihad (individual interpretation of the Qur'an and sunna) rather than the uncritical acceptance (taqlid) of orthodox interpretations of tradition by ulama. At the same time, the modern Indonesian state has not always had an easy relationship with the polity's cultural-religious identification. Indonesia declared its independence from the Netherlands in August 1945, but in the months leading up to it, a lively constitutional debate took place centering in part on the emerging pancasila (five principles) ideology of Sukarno, Indonesia's first president. Enshrined in article 29, section 1 of the 1945 constitution, the five principles are belief in one God, national unity, humanitarianism, consensus democracy, and social justice. Originally, the first principle also contained the words "with an obligation for Muslims to implement Islamic law," but this was soon dropped by the largely secular-nationalist minded Sukarno. This left many stricter Muslims, particularly from outside Java, with the sense that the finalized constitution marginalized Islam. Sukarno and his nationalist allies soon successfully weakened and splintered the Islamic political party, Masjumi (an acronym for the Council of Indonesian Muslim Associations) in an attempt to reduce its political appeal. By 1958, opposition to Sukarno's increasingly authoritarian "guided democracy" led to open rebellion under the aegis of the short-lived Revolutionary Government of the Republic of Indonesia. After the military crushed the rebellion, Sukarno jailed many of Masjumi's leaders for their involvement and eventually outlawed the party. Erstwhile Islamic militias such as Darul Islam and Tentara Islam Indonesia, which had participated in the war of independence against the Dutch, met with similar fates. Sensing the threat they posed to his nationalist project, Sukarno banned both, and by the 1960s, they had fallen into disarray after suffering sustained attack from the Indonesian armed forces. In 1965, a failed coup ignited a bloody power struggle in which the army purged the country of President Sukarno's communist allies and installed Gen. Suharto as head of state. With the rise of Suharto, failure to profess a recognized religion meant potential persecution as a communist, a fate the majority of Indonesians were eager to avoid as it is estimated that between 500,000-1,000,000 alleged communist sympathizers died in a brutal slaughter between 1965 and 1966. It thus comes as little surprise that between 85 to 90 percent of the Indonesian population carry identification cards identifying themselves as Muslim. Keen to stymie any challenges to his authority, Suharto also refused Masjumi a return to politics, and with his 1971 overhaul of the electoral system, he effectively de-Islamized Indonesia's state-level political structure. The major Islamic organizations were forced to align themselves under the banner of a regime co-opted political party, the United Development Party (Partai Persatuan Pembangunan). Nevertheless, Suharto was only partially successful in subsuming society's Islamic identification to the diktats of his "New Order" ideology. In effect, his marginalization of political Islam merely precipitated a greater role on its part in fostering civil society activity. Rather than directly challenge the authorities for political power, moderate reformists such as Dawan Rahardjo, Djohan Effendi, and Nurcholish Madjid focused on building a strong and dynamic Islamic community based on education and social welfare. Their ideas on Islamic social and educational renewal emerged in close association with the Islamic Students Association (Himpunan Mahasiswa Islam), which appealed to a younger generation of well-educated, urban, middle-class Indonesians who were enjoying some of the benefits of New Order economic development. By the 1990s, Suharto himself began to encourage the restoration of Islamic issues onto the political agenda. Eager to court Islamic support as a counter to growing pro-democracy sentiment and rumbling military dissent, it became politically advantageous for Suharto to tolerate Islamic political activism. He promoted pro-Islamic officers in the army and supported the Association of Muslim Intellectuals (Ikatan Cendekiawan Muslim Indonesia) made up largely of professionals, scientists, economists, educators, scholars, and regime supporters. The strategy eventually backfired in the wake of the devastating Asian financial crisis of 1997. The Indonesian rupiah went into free fall against world currencies, and the banking sector collapsed under a mountain of bad loans. The prices of oil, gas, and other commodity exports plummeted as per capita gross domestic product fell by 13 percent. The crisis was exacerbated by Indonesia's worst drought in fifty years. As inflation soared, food prices rose, and ensuing shortages led to widespread rioting. By the following year, Suharto's grip on power had loosened in the face of the economic meltdown and pressure from the reformasi movement, the broad movement to bring down Suharto's New Order. Prominent Islamic leaders such as Abdurrahman Wahid, president in 1999-2001, Amien Rais, leader of Muhammadiyah, and Nurcholish Madjid along with their associated organizations played major populist roles in Suharto's eventual downfall and its aftermath by helping to disseminate democratic values throughout society via voter education and election monitoring. Their links to Muslim activists on the frontlines of student protests and rallies against the president exemplified the compatibility of Islam with democracy, political rights, and justice. Underscoring moderation and support for Sukarno's five principles was crucially important during the turmoil and prevented calls for the creation of an Islamic state from gaining any traction. Appeals to Indonesians' sense of tolerance and national pride took precedence. Suharto tried to deflect public anger by blaming Sino-Indonesians and global financial institutions for the crisis, but tensions within the military weakened his hold on power. Factional splits that had developed in the 1980s between "red and white" (secular nationalist) and "green" (Islamic) groups increased, and some began questioning Suharto's authority. In this turbulent economic and political climate, factions within the green military began shifting their support to the Indonesian Council for Islamic Da'wa (Dewan Dakwah Islamiyah Indonesia) and the Indonesian Committee for Solidarity of the Islamic World (Komite Indonesia Untuk Solidaritas dengan Dunia Islam), both of which received substantial funding and donations from Saudi Arabia and Kuwait. Eventually, key factions of the military simply abandoned the president. He had become too much of a liability. Upon Suharto's departure, pressure mounted on Abdurrahman Wahid, leader of the NU, to run for office. Wahid was wary of NU's return to politics as potentially damaging to its social mission but was eventually persuaded to head the newly-formed National Awakening Party (Partai Kebangkitan Bangsa), which combined Islam with the nationalist pancasila ideology. Notwithstanding NU's long-time championship of an Islamic-oriented Indonesia and Wahid's personal stature, neither it nor any of the welter of Islamic parties and groups that sprang up in the post-Suharto environment could achieve a parliamentary majority. By late 1998, the prospect of a single Islamic political voice emerging looked highly unlikely. Although forty out of eighty political parties were, to varying degrees, Islamic-oriented, this number decreased by election time in 1999 to twenty eligible groups. The outcome of this proliferation of parties was ultimately unsatisfying for all contenders. Megawati Sukarnoputri (Sukarno's daughter) led the secular-nationalist Indonesian Democratic Party-Struggle (Partai Demokrasi Indonesia-Perjuangan) to 37.4 percent of the vote (153 seats in parliament) while Wahid's National Awakening Party only garnered 12.6 percent of the vote for 51 seats. Despite this, behind-the-scenes jockeying for power and horse-trading maneuvers by Islamic groups produced a coalition that backed Wahid for the presidency. Wahid, however, was simply unable to hold together a broad coalition of competing interests. Notwithstanding the increased Islamic influence that led to his elevation, the confusion that reigned during Wahid's presidency (and his eventual impeachment in mid-2001) indicated a process still very much in transition. But rather than impeachment signaling a return to authoritarian ways, it became the first big test of Indonesia's new democratic credentials. Parliament followed constitutional protocol by replacing Wahid with then-vice-president Megawati Sukarnoputri, who went on to complete the remainder of Wahid's five-year presidential term. Ironically, the Islamic groups who had pushed so hard for Wahid to serve were now left with the unpalatable option of the secularist Megawati as the next constitutionally mandated president. They duly accepted the appointment, nonetheless. Political machinations aside, developments in the post-Suharto party system introduced political players with stricter forms of Muslim identity politics capable of appealing to major Muslim constituencies. Islamic-oriented political parties appeal to sections of more conservative-minded, urban middle classes with an interest in promoting social decency, political moderation, and piety based on Islam as an ethical reference. The moral concerns of these constituencies combined with feelings of uncertainty toward social change in the face of rapid development have no doubt helped bolster the appeal. Yet, while the number of Islamic parties is more prevalent than at any time in Indonesia's past, most of their involvement is of a moderate kind and very far from being associated with the institution of an Islamist theocracy. Moreover, the results of the 1999 election indicated clearly that Indonesians en masse favored a democratic polity over an Islamic state, giving the secularist-nationalist parties of the Indonesian Democratic Party-Struggle and the Golkar party 58.3 percent of the vote while the various Islamic parties amassed less than 42 percent. True, the Islamist Prosperous Justice Party (Partai Keadilan Sejahtera or PKS), whose leaders claim it does not seek to impose Shari'a (despite links to the Muslim Brotherhood), increased its vote from 1.5 percent in 1999 to 7.45 percent in 2004. But this success was largely a result of its image as a relatively new and untainted party, as well as the stagnation and subsequent unraveling of Megawati's tenure. The PKS leadership skillfully exploited the situation to cast itself as a "clean" Islamic party committed to an anti-corruption platform, rather than to the imposition of Shari'a rule. Although the public's perception of it has tarnished somewhat over the years, especially recently, it marginally increased its share in the People's Representative Council (the Indonesian version of the House of Representatives) in the 2009 elections to almost 8 percent but made less significant inroads in many of the regions. Most significantly, the PKS and other Islamic-oriented groups represent only 169 out of 560 seats in parliament—a mere 30 percent. The stunning electoral triumph of the secular-nationalist Democratic Party (Partai Demokrat) in 2009 with 148 seats alongside the more established Golkar and Indonesian Democratic Party-Struggle groups (106 and 94 seats respectively) indicates that Islam does not necessarily trump other interests or issues in Indonesia. Still, there is a growing concern that not enough is being done to combat radicalism, intolerance, and increasing intimidation of local religious minorities by hard-line Islamist vigilantes such as Front Pembela Islam (Islamic Defenders Front). The Indonesian experience shows that countries do not emerge in a straightforward transition from authoritarian rule to multiparty democracy overnight: The challenges of transition are multiple. Success depends on translating momentum for change into meaningful reform and improvements over a sustained period of time. This involves redressing past injustices, economic stabilization, popular legitimization, judicial reform, diffusion of democratic values, marginalization of anti-system actors, ensuring greater civilian rule over the military, party system development, and the routinization of politics. What also needs to be recognized is that democratization is not the same as democracy; one is a process, the other a political system. Democracy can become the "only game in town" if and when change occurs incrementally on the behavioral, attitudinal, and constitutional levels. Indonesia's transformation, in common with other democratizations, has been anything but easy. There continue to be corruption issues, ongoing policy ineffectiveness, judicial problems, institutional frictions, and personality politics but what is clear is that there has been substantive reform. The political system is now a functioning democracy with all its benefits and shortcomings. Reviewing the steps taken to get there may help in producing applicable measures for steering the turbulent Middle Eastern societies toward a more democratic future. To begin with, there is the need to organize free and fair elections though elections in themselves can hardly be expected to channel contests peacefully among political rivals or accord public legitimacy. There also has to be corresponding reform of state institutions, policymaking procedures, and an attendant recovery of civil liberties. Inclusive suffrage, the right to run for office, enhanced freedom of expression, and access to alternative information are some of the necessary building blocks. Indonesia's first two elections in 1999 and 2004 were the freest in more than forty years with huge amounts of political activity and media coverage. The lifting of press restrictions, the release of political prisoners, and the formation of new political parties all bore witness to its climate of reform. Dismantling the most repressive structures of an authoritarian regime and removing the military gradually from politics are also major tasks of reform. 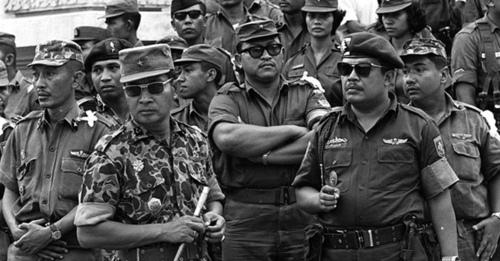 In Indonesia, political leaders moved quickly to separate the police from the military. Turning the military into an asset rather than a threat to the process is a challenge but not insurmountable. Persuading the generals to "return to the barracks" involves investment in their professionalism, an appeal to their sense of honor, and realistically, an appeal to their wallets. To prevent a reactionary backlash, allowing the military to retain substantial economic interests may be a prudent move if a difficult pill to swallow in the short term. However, one must be exceptionally wary of grand bargains being struck, whereby political hegemony is transferred on the assurance that the military unconditionally retains its reserved economic domains and privileged status. Rather, the aim must be to create enough time and space to institute some step-by-step reforms and gradually phase out military embeddedness in the body politic, something that the recent Middle Eastern revolutions have thus far failed to do. Indonesia managed to reduce the sociopolitical role of its armed forces by allowing it to retain its substantial economic interests in the short term, and there have even been attempts to phase this out completely although very incrementally. This paved the way for constitutional reform of the army's dual role in politics and the economy in 2002 and the formal removal of its allocated seats in parliament in 2004. All of this brought improved civilian rule of the military over time. This, in turn, can help in the provision of transitional justice. A society often needs to allow some of its open wounds to heal so that it can move on. It is an incredibly fraught and thorny process, but one way to do this is to give them a good "airing." This may involve the establishment of some form of truth and reconciliation commission as in South Africa or East Timor, depending on circumstance. South Africa provides a better template for reconciliatory justice than the attempts in East Timor. The 2002 Ad-Hoc Court for Human Rights Violations in East Timor convicted only a small number of lower-ranking military officers. Indonesia's military (especially its top commanders at the time) have largely avoided recriminations. Syria represents a perfect example of where such an undertaking will be critical, but this process may also be applied in such countries as Egypt, Libya, and Tunisia where long-standing authoritarian regimes were swept from power. The scale of the Assad regime's violence and the country's crosscutting sectarian rivalries make the potential for wide-scale retribution and bloodletting a very real prospect. Future prosecutions at the International Criminal Court or a similar tribunal for the worst offenders of the Syrian regime should be contemplated. Such steps are important in post-conflict situations as they provide mortar to rebuild respect for state institutions and the rule of law. Restoring pride and trust in institutions such as the judiciary, law enforcement, and security services is a massive task of reform that will take time and substantial effort. A third critical factor, major constitutional and decentralization reform, brought improved representation and accountability to Indonesia, albeit by degrees. Although far from perfect, the restructured People's Consultative Assembly (Majelis Permusyawaratan Rakyat) now consists entirely of popularly elected members sitting in the People's Representative Council and a new Regional Representatives Council (Dewan Perwakilan Daerah). In fact, Indonesia's 2004 elections bore witness to a meaningful and extensive number of permitted political parties, stabilized election rules, amendments to decentralization legislation, and constitutional limitations on the power of the executive. The president is elected directly and can only serve one renewable five-year term. Parliament has also gained more power in the legislative process, which encourages the president to maintain broad support in the legislature. The success of Indonesia's 2009 elections further attests to real stabilization and routinization. A diverse media remains open and vigorous, and civil society activity continues to flourish with an array of nongovernmental organizations and pressure groups. This is not to say things are all smooth sailing, but most important is the fact that the new democratic framework is accepted. Current president Yudhoyono may be ex-military, but he is unconditionally committed to, and readily submits his interests to, the new rules of the game—something that new Middle Eastern leaders have yet to learn. The recent Islamist electoral successes in Tunisia and Egypt suggest a different political dynamic than Indonesia. Yet the tenor of the uprisings, at least in their initial phases, as well as subsequent reactions to authoritarian behavior by elected Islamist officials, indicate that a substantial number of people in these countries, as in Indonesia, will expect parties to respect the rule of law and address their countries' economic and corruption problems. As evidenced by the public backlash to Egyptian president Mohamed Morsi's recent power grab and the assassination of Tunisian opposition leader Chokri Belaïd, attempts at a coercive institutionalization of Islamist theocracy may well be met with continued protests and uprisings. The real issue for the Middle East is not whether it will be secular or Islamic. In many ways, this is a false dichotomy and a distraction from much greater concerns. What one is witnessing in the region is a simultaneous convergence of multiple social, economic, and political vectors bringing things into sharp relief. Looking at the conditions in these countries, there were clear indications that storms were brewing. Despite the substantial wealth that narrow self-serving elites enjoyed (some of which trickled down to the middle classes), economic stagnation was rife; combined with rising prices for basic foodstuffs and high unemployment among educated, tech-savvy but disenfranchised youth this created an extremely volatile mix. What the people of the region now have to do is find ways to strike a different social contract by translating the popular momentum for greater political freedoms, effective rule of law, and better living conditions that brought down their autocrats into representative capacity. And if the Indonesian example teaches anything, it is that moderate Islam and democratic development are not incompatible bedfellows. Paul J. Carnegie is senior lecturer in political economy at the Institute of Asian Studies, Universiti Brunei Darussalam. He is the author of The Road from Authoritarianism to Democratization in Indonesia (Palgrave Macmillan, 2010) and taught previously in both Egypt and the United Arab Emirates. See, for example, Thomas Carothers, "Egypt and Indonesia," The New Republic, Feb. 2, 2011; Jay Solomon, "In Indonesia, a model for Egypt's transition," The Wall Street Journal, Feb. 12, 2011. Clifford Geertz, The Religion of Java (Chicago: Chicago University Press, 1960), pp. 121-31. Fauzan Saleh, Modern Trends in Islamic Theological Discourse in 20th Century Indonesia: A Critical Survey (Leiden: Brill 2001), pp. 17-29. Robert Cribb, ed., The Indonesian Killings of 1965–1966: Studies from Java and Bali (Clayton: Monash University Centre of Southeast Asian Studies, 1990), p. 12; idem, "Genocide in Indonesia, 1965-1966," Journal of Genocide Research, June 3, 2001, pp. 219-39. Suzaina Kadir, "The Islamic factor in Indonesia's political transition," Asian Journal of Political Science, 2 (1999), pp. 21-44. Mohammad Fajrul Falaakh, "Islam and the Current Transition to Democracy in Indonesia," in Arief Budiman, Barbara Hatley, and Damien Kingsbury, eds., Reformasi: Crisis and Change in Indonesia (Clayton: Monash Asia Institute 1999), pp. 201-12; Robert Hefner, Civil Islam: Muslims and Democratization in Indonesia (Princeton: Princeton University Press, 2000), pp. 189-200. Ken Young, "The national picture: A victory for reform?" in Susan Blackburn, ed. Pemilu: The 1999 Indonesian Election (Melbourne: Monash Asia Institute, 1999), pp. 3-11. Komisi Pemilihan Umum, "Indonesian elections with figures and facts 1955-1999," General Elections Commission, Jakarta, 2000. Sadanand Dhume, "Indonesian Democracy's Enemy Within," Yale Global, Dec. 1, 2005. See, for example, "Indonesia: 'Christianization' and Intolerance," Asia Briefing, no. 114, International Crisis Group, Jakarta/Brussels, Nov. 24, 2010, p. 17; "Religion's Name: Abuses against Religious Minorities in Indonesia," Human Rights Watch, New York, 2013, pp. 60-6, 71-86. Andreas Schedler, "What Is Democratic Consolidation?" Journal of Democracy, Apr. 1998, pp. 91-107. Juan Linz and Alfred Stepan, Problems of Democratic Transition and Consolidation: Southern Europe, South America and Post-communist Europe (Baltimore: Johns Hopkins University Press, 1996), pp. 5-14. Paige Johnson Tan, "Indonesia Seven Years after Soeharto: Party System Institutionalization in a New Democracy," Contemporary Southeast Asia, 1 (2006), pp. 88-114; Douglas Webber, "A Consolidated Patrimonial Democracy? Democratization in Post-Suharto Indonesia," Democratization, 3 (2006), pp. 396-420; Marcus Mietzner and Edward Aspinall, "Problems of Democratisation in Indonesia: An Overview," in Edward Aspinall and Marcus Mietzner, eds., Problems of Democratisation in Indonesia: Elections, Institutions and Society (Singapore: Institute of Southeast Asian Studies, 2010), pp. 1-20. Adam Przeworski, Democracy and the Market: Political and Economic Reforms in Eastern Europe and Latin America (Cambridge: Cambridge University Press, 1991), p. 26. Related Topics: Middle East politics, Southeast Asia | Summer 2013 MEQ receive the latest by email: subscribe to the free mef mailing list This text may be reposted or forwarded so long as it is presented as an integral whole with complete and accurate information provided about its author, date, place of publication, and original URL.